Some pupils having a good time during lunch. Three cooks employed under the National Home-Grown School Feeding Programme have been fired for different corrupt practices. Everywhere you face in Nigeria, there is always one corruption issue to tackle. Is it as a result of poverty or the desperate mind of such individuals just pushing them? Corruption has also found its way into the National Home-Grown School Feeding Programme (NHGSFP) of President Muhammadu Buhari's administration. Students in Cross River State may have been wondering why they are not enjoying the food they are supposed to enjoy as promised by the current administration. Three cooks, Mary Obaji, Mary Ikrihi and Christopher Odey in Cross River State, have been found wanting over alleged corrupt practices in respect to their feeding. They have been enjoying while the children are not fed. The administrators discovered misgivings in the way they were handling the feeding programme and sacked them with immediate effect. One of them, according a tweet, by the NHGSFP administrator, one of them has repeatedly refused to show up while the other two have consistently fed the children biscuit instead of the food they were supposed to get. 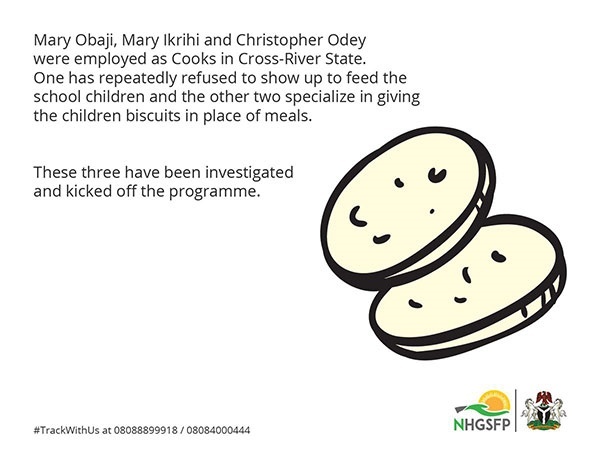 The tweet read: "Nigerian government's School The following Cooks, Mary Obaji, Mary Ikrihi and Christopher Odey in Cross River State have broken the approved rules of of #NHGSFP. They have been dismissed as Cooks with immediate effect". 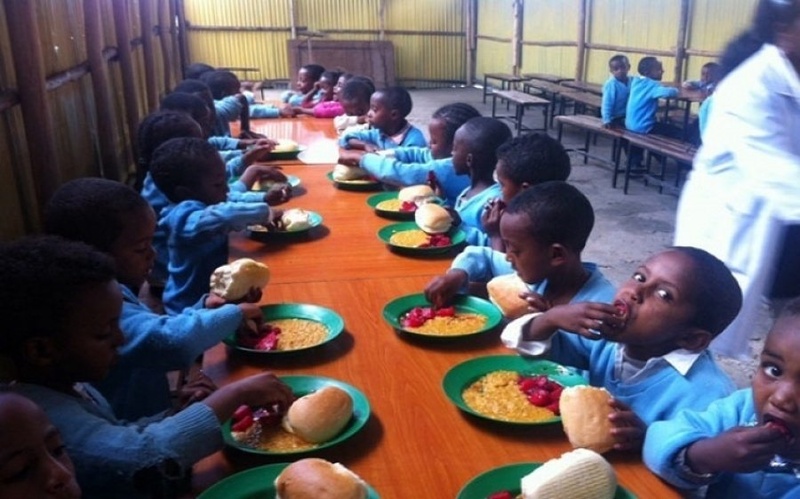 At the moment, 19 states are partaking in the National Home-Grown School Feeding Programme and over 6.6 billion Naira has been spent on feeding the school children.